The Robertsbridge Codex is a rare little thing. It’s only a few pages in an otherwise obscure manuscript, but it’s noteworthy because it’s the first known collection of music meant specifically for keyboard instruments. Here’s a page from the Codex. This is a photograph of a page in Carl Parrish’s book, so you might want to look online to get an image with better resolution. The treasure currently resides in the British Library, in London and the tale of how such an important piece of music came to be in this obscure little place is a good one. Robertsbridge is a village in East Sussex, England, about 10 miles north of Hastings (made famous in the Battle of Hastings in 1066). The Rother River passes through it. The town is thought to have developed around a 12th century Cistercian abbey, named by Richard I (1157-1199) in 1198 for his steward, one Robert de St. Martin (dates unavailable). It was settled by monks from the mother abbey in Boxley, in Kent, about an hour’s drive north, and was probably built roughly on the site of a war memorial and a spring known as St. Catherine’s well. The monks at Robertsbridge were known as the “white monks” because they wore tunics of undyed wool. The site was probably originally a small chapel, but it received many gifts and endowments from such families as the Bodiams (who later had a castle nearby) and the Etchinghams (nearby landowners since before the Norman Conquest). As a result, they were able to build a new abbey about a mile east of the original site in about 1210. The Robertsbridge abbot was sent, along with the abbot from nearby Boxley, to search for King Richard I (1157-1199), who was being held hostage in Bavaria after his return from the Crusades in 1192, and when they found him, they went back to England to raise his ransom. Later, these same two abbots were sent as agents for the Archbishop of Canterbury to see the pope about a quarrel with the monks at Canterbury. In 1212, 1221, and 1225, the abbot of Robertsbridge was again sent as the king’s emissary to Europe (first John then and Henry III twice), and the Henry III also paid the abbey a visit in 1225. The abbey had faded in fame by the 1400s and escaped the first suppression of the monasteries. It survived until 1538, when it was dissolved under Henry VIII (1491-1597). It was surrendered by the abbot and eight monks—everyone else had long gone. After the dissolution, the abbey buildings were acquired by Sir William Sidney of Penshurst (1482?-1554), and it stayed in that family until 1720. The remains of the abbey survived for most of the 18th century but were then destroyed. All that remains today is the former abbot’s house, now a private residence. The town flourished without the abbey, with some fine castles and good schools and such. Today, it’s the home of Heather Mills (b.1968), former wife of Beatle Sir Paul McCartney. Robertsbridge came to fame when the eponymous codex was discovered among other records at Penshurst Place in Tonbridge, Kent (about half an hour’s drive south of London) in the mid-19th century. It was found in a bundle with an old register from the Robertsbridge Abbey. Originally, it was thought to be from as early as 1325, but later scholars determined that 1360 was more likely. It’s an important document because it’s the earliest known collection of music written specifically for keyboards. It’s also the earliest preserved example of German organ tablature. It’s called “German” because it appears later only in Germany, slightly more developed, where it’s also known as the Ludolf Wilkin tablature, from 1432. 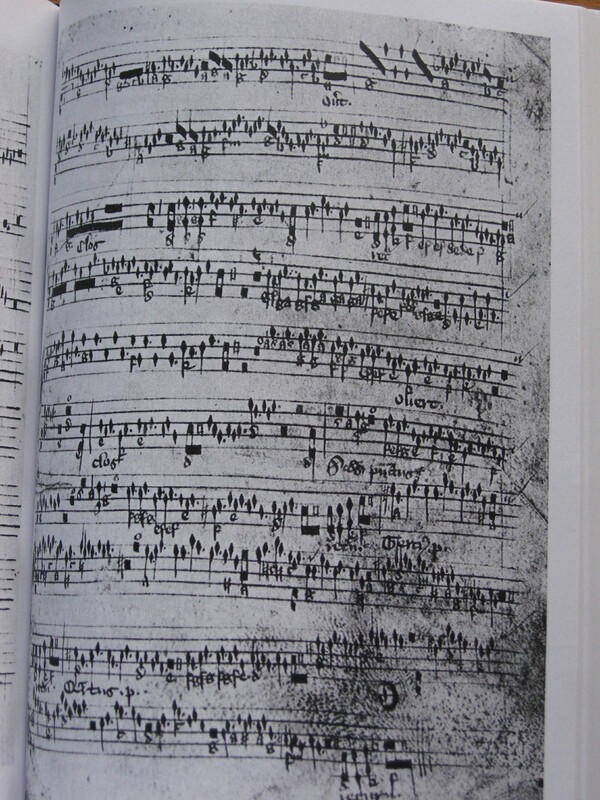 This tablature was adopted exclusively for writing down organ music and was used until Samuel Scheidt’s (1587-1654) Tablatura Nova and Johann Ulrich Steigleder’s (1593-1635) Ricercar Tablaturen, replaced it in 1624. After this date, particularly in Northern Germany, many important sources of keyboard music are written in this notation. It’s a little off topic, but Old German tablature, from the early 15th century to mid-16th century, used letters to identify the notes to be played, rather than neumes or mensural notation on the staff, in all the voices except the highest, which was in neumes that we would recognize as notation today. These highest parts were usually red in color and provided decorative musical figuration; it’s also where we get the term that survives until today in the modern word “coloratura.” Cool, eh? This tablature also included the squared lower-case B, which resembles a lower-case H that represented B-natural (which nomenclature survived well past Johann Sebastian Bach’s time, where he called things H-moll for B-minor, as in the B Minor Mass) and an S for “sine,” which is Latin for “without,” and meant a rest, or silence. The Codex contains other things than music, although I didn’t find a source that said what exactly those other things are. There are only two musical sections, containing six pieces. Three are estampies, which is an Italian dance from the trecento, and had scholars convinced that the music came from Italy originally. Three songs are arrangements of motets, two of which are from the Roman de Fauvel. You can learn more about that in my post, Composer Biography: Philippe de Vitry (1291-1361). The Codex contains instrumental transcriptions of two of Vitry’s Fauvel motets (Firmissime/Adesto and Tribum, quem non abhorriuit), and another motet from Roman de Fauvel with organ accompaniment. There are also three Italian-style dances (estampies). Now then. On to the music itself. The Codex contains the end of a purely instrumental piece in the estampie form. There are two complete pieces in this form, the second of which is marked “Retroue.” There’s also an incomplete transcription of the hymn Flos vernalis. These may have been meant to be played on an organ, and a little later, Edward III (1312-1377) presented his captive, John II of France (1319-1364) with an eschiquier (an instrument that was the predecessor to the harpsichord) and a copy of the piece. The Robertsbridge transcriber went a little heavy on ficta (accidentals, more often sharps than flats), to the point of inserting naturals to return the note to its original state rather than assuming the natural as the default. He also transposed one piece from the Fauvel motet up a step, forcing a single sharp into the key signature of the right hand. (The left hand had its own key signature and stayed as it was.) He also occasionally added notes where he thought the harmony was too thin. It’s possible that the motets were included in the Robertsbridge Codex for political reasons as allegories for political events of the period, such as the public hanging of Philip the Fair’s (France, 1268-1314) unpopular chancellor Enguerrand de Marigny (1250-1315), or about some enemy of Robert of Anjou, King of Naples (1277-1343), or perhaps a celebration of the new Pope Clement IV (1190-1268). All of the music is unattributed (late scholars have identified de Vitry as one source), and all is written in tablature. The estampies are written for two voices, often in parallel fifths and using the hocket technique (where one voice has artful rests that are filled in by another voice, like an exchange of hiccups). It’s important to note that at this time (the 14th century), organ keys became narrower so that more could fit onto a keyboard table, and also accommodating a wider range of pitches (such as 12 notes to an octave) and sustained chords. This made it possible for a rhythmically fluid and complex decorative voice to unfold beyond the earlier isorhythmic pieces. Robertsbridge features an isorhythmic motet with a patterned scaffolding in the left hand as a foundation for a dramatic instrumental display played by the right hand. This became a pattern that we’re still using today. The Rupertsbridge Codex marks the beginning of our modern sense of a slower or chordal left hand with a busy and ornamental right hand. Despite its quiet lack of fame, it’s really a very important document. “Music in Medieval Manuscripts,” by Nicolas Bell. University of Toronto Press, Toronto, 2001.